COSTA MESA, CA (June 20, 2018) – Two points. After four rounds and eight races in the 2018 MotoAmerica Motul Superbike Championship, just two points separate two-time MotoAmerica Superbike Champion Cameron Beaubier from defending series champion Toni Elias. That’s right. Two measly points. And now the battle heads to WeatherTech Raceway Laguna Seca for this weekend’s Championship of Monterey in Northern California with all the ingredients in place for a thriller. Add in the fact that the MotoAmerica races (Motul Superbike, Supersport, Liqui Moly Junior Cup and Twins Cup) will take place on the same weekend as the World Superbike round at Laguna and you have the makings of a weekend that won’t soon be forgotten. First things first. That Motul Superbike Championship. Prior to the Road America round three weeks ago, things were going all Toni Elias’ way. The Spaniard and his Yoshimura Suzuki GSX-R1000 had won five of the six races and he was leading the title chase by over 30 points. Then Road America happened. In race one in Wisconsin, a three-way fight for the lead between Beaubier, Elias and Josh Herrin resulted in controversial contact between Beaubier and Elias, with Elias crashing out. Beaubier beat Herrin for his first victory of the season and, with Elias failing to score a point, the championship is suddenly a fight again. The following day saw Beaubier and his Monster Energy/Yamalube/Yamaha Factory Racing YZF-R1 beat Herrin to the finish line again, with an out-of-sorts Elias ending up fourth. So now, as the series heads to the Monterey Peninsula, Elias is no longer atop the championship point standings. For the first time all season. But, again, we’re only talking two points here. 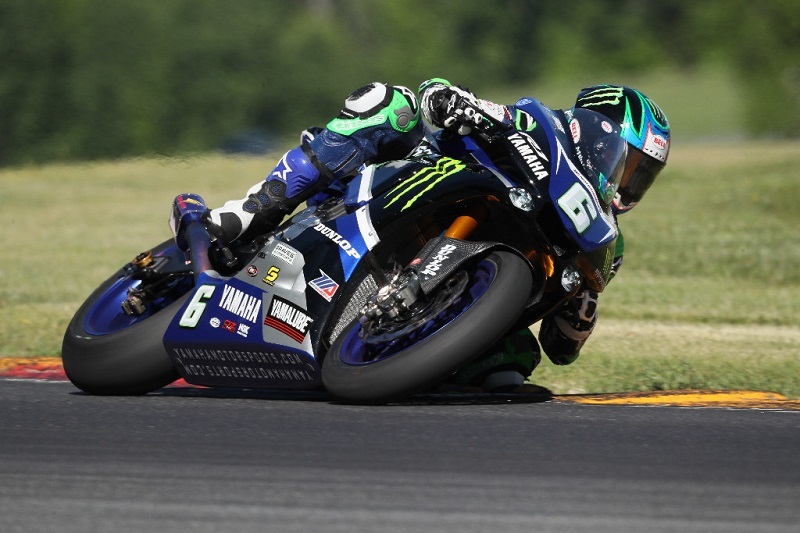 With his two impressive second-place finishes at Road America, Attack Performance/Herrin Compound’s Josh Herrin vaulted himself to third in the championship point standings. Herrin is 38 points behind Beaubier, 36 behind Elias and 10 ahead of Yamalube/Westby Racing’s Mathew Scholtz, the South African the only rider other than Beaubier and Elias to taste victory this season. Herrin has three podium results heading into this weekend’s races and all three have been runner-up finishes. Herrin is punching the clock and really going to work this weekend as he will take part not only in both MotoAmerica Motul Superbike races, but also in the two World Superbike races. While Herrin had two stand-out rides in Wisconsin, Scholtz suffered through his worst weekend of the season. The South African crashed in race one, remounted and scored two points. In Sunday’s race two, he crashed again and wasn’t able to remount, losing 38 points and his third-place spot in the points to Herrin. M4 ECSTAR Suzuki’s Jake Lewis continues to pound away at a consistent season with five fifth-place finishes. Lewis did one better than that in race one at Road America with his fourth-place finish but dropped a spot on his average with a sixth on Sunday. Lewis is – you guessed it – fifth in the title chase heading to Monterey. Then comes Motul Superbike rookie Garrett Gerloff, the two-time MotoAmerica Supersport Champion who turned heads last year at WeatherTech Raceway with his fast lap times in the Supersport class. Gerloff has already visited the Superbike podium three times and he’s just three points behind Lewis in the championship. Racer/team owner Kyle Wyman is seventh, eight points behind Gerloff and nine ahead of Scheibe Racing BMW’s Danny Eslick with Eslick having his best weekend of the season so far at Road America. Fly Street Racing’s David Anthony and Quicksilver/LEXIN/Hudson Motorcycles’ Bobby Fong round out the top 10 in the series as we hit the halfway point in the season this weekend. With the top two in the Motul Superbike class separated by just two points, that’s the polar opposite of the Supersport class where Monster Energy/Yamaha Extended Service/Graves Yamaha’s JD Beach has built himself a 43-point cushion in the championship. Beach has won four of the six races and finished second in the other two to lead Rickdiculous Racing’s Hayden Gillim, 140-97. TSE Racing’s Cory West is third in the series, 18 points behind Gillim and 19 ahead of Tuned Racing’s Braeden Ortt. M4 medAge Suzuki’s Nick McFadden is just one point behind Ortt after his best weekend of the year at Road America. Beach had to face M4 ECSTAR Suzuki’s Valentin Debise for the first time at Road America, the Frenchman finally back on track after his crash at Daytona in March. Debise came back with a bang, winning race one at Road America and finishing second in race two. Much like in the Motul Superbike class, things got tight at the top in the Liqui Moly Junior Cup Series at Road America. In fact, the difference is the same: two points. Although he won on Saturday, championship points leader Alec Dumas crashed his Orange Brigade/JP43 KTM on Sunday and that allowed Yates Racing’s Aaron Yates to move to within two points in the championship. Sean Ungvarsky, who is also a member of the Orange Brigade, is third in the championship, 21 points behind his teammate. The new Twins Cup class will also compete at WeatherTech Raceway Laguna Seca with Ghetto Customs-backed Chris Parrish leading Altus Motorsports’ Jason Madama by seven points after three races. RBoM’s Curtis Murray is third in the standings, 33 points behind Parrish. With his five victories on the season, Toni Elias now has 21 Superbike victories, which puts him sixth on the all-time list in what is just his third season of racing in the MotoAmerica Series. The Spaniard is also the fastest in history to get to the 20-win mark. With his 21 wins, Elias is five behind Cameron Beaubier. Beaubier, who is fifth all-time, is just two wins behind fourth-placed Ben Spies on the list. Three riders have won Motul Superbike races this season: Elias (5), Cameron Beaubier (2) and Mathew Scholtz (1). Yoshimura Suzuki’s Roger Hayden earned pole position for last year’s two Motul Superbike races at WeatherTech Raceway Laguna Seca. Hayden lapped at 1:23.875 during Superpole to lead Josh Hayes (1:23.949) and Toni Elias (1:23.952). When it came to race time, no one was faster than Elias. The former Moto2 World Champion beat Hayden by .543 of a second to win race one on the 2.2-mile track with Beaubier finishing third, some eight seconds behind. In the second race, Elias again beat Hayden to the line – this time by 1.3 seconds after Hayden’s last-ditch effort to pass in the final corner. Josh Herrin finished third after Beaubier crashed out of the battle for the lead in Rainey Curve. Mathew Scholtz pulled off the double last year in the now-defunct Bazzaz Superstock 1000 class. Scholtz and his Yamalube/Westby Racing Yamaha YZF R1 have now joined the Motul Superbike class after taking the Superstock 1000 Championship in 2017. Garrett Gerloff won the Supersport race last year en route to earning his second straight Supersport Championship. Gerloff beat JD Beach by 1.5 seconds. Jason Aguilar, meanwhile, won the Superstock 600 race over Shane Richardson. Last year’s KTM RC Cup (now Liqui Moly Junior Cup) was all about Cory Ventura as he beat Alex Dumas, who is leading this year’s Junior Cup Series, by 4.7 seconds. Draik Beauchamp was third. MotoAmerica president and three-time 500cc World Champion Wayne Rainey won two Superbike races at Laguna Seca (1983 and 1986) and three 500cc Grands Prix (1989, 1990 and 1991). MotoAmerica’s Race Director Doug Chandler has also tasted success at Laguna, winning two Superbike races (1996 and 1997) as well as two Supersport races in April and July of 1998. Cameron Beaubier and Toni Elias are the only current riders in the Superbike class to have tasted Superbike success at WeatherTech Raceway Laguna Seca. In addition to winning two Superbike races here (one race in both 2015 and 2016), Beaubier has also won three Daytona SportBike (now Supersport) races on the Monterey Peninsula. Elias hadn’t won at Laguna prior to last year, but he won both races en route to the Superbike Championship.